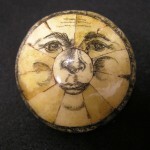 Hello, and thank you for your interest in my scrimshaw! Even as a child, I wanted to be an artist. In college, classical training in sculpture along with studies of ancient art history gave me a taste for precision, providing a three-dimensional approach to my work. 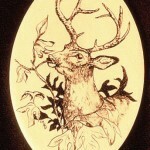 In 1979, my dream of a career in art became reality as Stone Hollow Studio, LLC. I love both history and art. 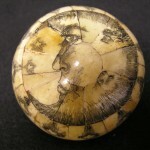 Scrimshaw provides a prime link for me, finding its origins with 18th -19th century American sailors. I use environmentally-friendly materials: primarily recycled ivory piano keys and cow bone. My work is done the old way: I draw each piece by freehand, painstakingly etch each line (no power machinery or patterns! ), adding ink when finished. I strive for a purity of line, making each line important to the whole work. 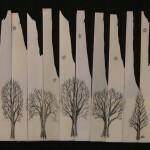 Perhaps more than other mediums, scrimshaw summons close study. In a world bombarded by supersizing, by big, loud “stuff,” it is calming to concentrate on what is delicately wrought. The simplicity of this traditional artform appeals to me: there is no color to distract from the actual art. The viewer sees only the line. It’s clean and straightforward; once a line is cut, it is permanent. My art has taken me all over the world and introduced me to wonderful people. I was invited by the Missouri Governor’s office and the National Parks Foundation to design and create ornaments six times for the National Christmas Tree display in Washington, D.C. (in 2010, 2011, 2013, 2014, 2015 and 2016). My work has been exhibited in the White House Visitor Center, in President’s Park (D.C.), Missouri Capitol Rotunda, Missouri Governor’s Mansion, St. Louis Cathedral Basilica, and remains in the permanent collection of the Smithsonian Institute and the Dedalo Museum of Contemporary Art in Italy. Early American Life magazine has selected and featured my work in its prestigious Directory of Traditional American Craftsmen. 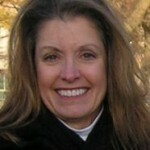 I am the former Executive Director of Missouri Artisans Association/The Best of Missouri Hands (2007-2011). I also served three terms as this organization’s president, one term as vice president and one as advisor. Most recently, I was the Executive Director of Missouri Citizens for the Arts, the statewide arts advocacy agency, working in Missouri’s Capitol specifically to secure funding for Missouri Arts Council, the Cultural Partners in our state, and the Missouri Fine Arts Academy. I am a charter member of the Lietuenant Governor’s BuyMissouri program. In addition to my art, I remain Arts Editor for a monthly magazine in St. Louis. Clearly, I am passionate about art.